The Mile, Pocklington, YO42 1TW. On the road out of Pocklington towards Millington. 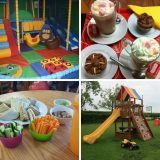 For younger children, under five, there’s a lovely indoor soft play area with double slide, mats and building toys, plus an outdoor play area with climbing frame, swings and ride-on toys. Staff are very helpful, excellent children’s food choices and the staff were happy to make anything else not on the menu. Lots of high chairs to use and good baby change/children’s toilet. Large outdoor play area too. Smile Café is proud of its reputation for customer satisfaction, value for money and excellent food – with a food hygiene rating of 5/5. For more information and bookings please call Jo on 01759 305420, email info@themilefarmshop.co.uk, or check out their website here or their facebook page here.